After months of rampant speculation, scientists announced late last year that the bright spots on dwarf planet Ceres are giant deposits of salt. Case closed, right? Not exactly. We’ve since gotten a better look at the spots, and the craters they reside in, and Ceres is shaping up to be a much weirder place than we imagined. Two new scientific papers offer depth, detail, and more riddles to the story of Ceres, the dwarf planet that NASA’s Dawn Spacecraft has been orbiting and analysing since last spring. The first study, published today in Nature, argues that the bright material residing in Ceres’ craters is sodium carbonate, an ocean mineral best known for its use in household cleaning products. If this finding holds up, it would make Ceres the most carbonate-rich world aside from Earth, a notion that planetary scientists find downright baffling. Especially when you consider the second study, published today in Nature Geoscience, which finds that Ceres is drier than we originally thought—not bone dry, but certainly no ocean world. How enough of its ice could have melted to form carbonates remains a mystery. Over the past year, theories on Ceres’s bright spots, and how they relate to the dwarf planet’s interior, have evolved as the Dawn spacecraft gathered more information. At first, scientists suspected the glittering craters were filled with water ice; oozing, perhaps, from a subterranean ocean. But when Dawn arrived at Ceres, early spectral data showed that the crater material was far too bright to be pure water; it had to contain some form of salt. This conclusion was cemented in a study published last December in Nature, which analysed visible wavelength data from Dawn’s Framing Camera, and concluded that the spots are probably magnesium sulphate salt with a smattering of water ice. The latest batch of studies point to more salt, less water, and unresolved mysteries about the dwarf planet’s interior. Analysing high-resolution spectral data collected last fall by Dawn’s Visible and Infrared Mapping Spectrometer, Maria Cristina De Sanctis of the Astronomical Observatory of Rome has now ruled out magnesium sulphates. Instead, her analysis points to sodium carbonate. Carbonate minerals, which precipitate out of seawater, form the basis of limestone, coral skeletons, and the shells of a wide variety of crustaceans and mollusks here on Earth. “These minerals can be formed only in a liquid water environment,” De Sanctis told Gizmodo, adding that the search for water on Mars has always followed the search for carbonates. Evidence for carbonate minerals has been found on Mars, supporting the notion that the Red Planet once had oceans. Sodium carbonate has also been discovered in the icy geyser erupting from Saturn’s moon Enceladus. But if De Sanctis and her colleagues are correct, Ceres has both of these watery worlds beat. “The amounts [of carbonates] we are seeing on Ceres are much higher than any other deposits in the solar system beside Earth,” she said. To add to that mystery, De Sanctis’s analysis turned up no firm evidence for water in any of Ceres’ craters. And another study, led by Michael Bland of the US Geological Survey, indicates that the dwarf planet’s interior is fairly dry, too. “Before Dawn’s arrival there was this expectation that Ceres would be relatively ice-rich,” Bland told Gizmodo, describing a popular model that held Ceres to have a rocky interior covered by a thick sheet of water ice. But this model doesn’t square with what we see on Ceres’ surface. “The work I did before arrival suggested that if Ceres is ice rich, the craters should become relatively flattened over short timescales,” Bland said, explaining how the slow migration of subsurface ice would uplift the crater floors, causing them to become shallow. “This is a process we see on lots of moons in the outer solar system, including Enceladus,” he continued. 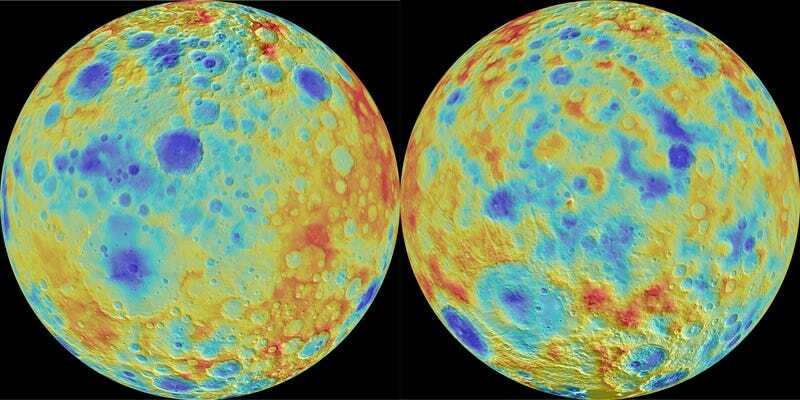 “But almost immediately on arrival at Ceres, it became obvious that there are large, deep craters—in some cases five to six kilometres.” Coupling the latest topographic data with numerical models, Bland estimates that Ceres’ subsurface can be no more than 35 percent water ice. Still, that might be enough water to form the liquid solutions needed to for carbonates — but how could a tiny world with temperatures of -105 degrees Celsius have patches of liquid water close to its surface? That is another mystery. “I think these are two pieces of the puzzle, and that there’s still work to be done to link them together,” Bland said. These riddles cut to the heart of a bigger puzzle, one that has implications for life on Earth and beyond: the origin of water in our solar system. Some planetary scientists believe that all the water in the inner solar system today came from the Kuiper belt, a vast collection of icy rocks cooling their heels beyond Pluto. The exotic minerals present on Ceres may point to an outer solar system origin, which would make this world a missing link between ice in Kuiper belt and oceans on Earth.